As Seattle housing becomes more compact and dense, the expansive backyard with green grass, lawn chairs and a barbecue grill is fast becoming obsolete. To compensate, Seattleites are looking skyward for open space. With the proliferation of new, boxy “modern” homes, Seattle’s house parties are, literally, being taken to a whole new level. 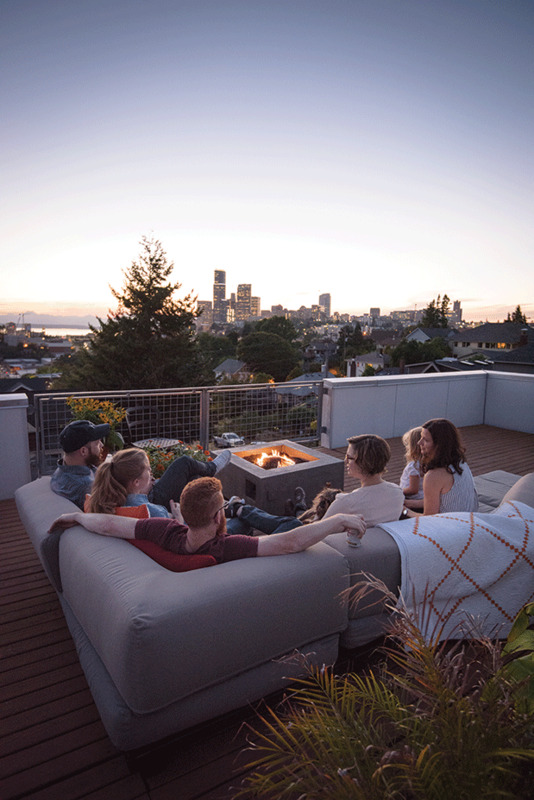 “That form of house [with its linear, simplistic design and bold roof lines] lends itself to these rooftop decks,” says Robert Humble, owner and principal of Seattle-based design and development firm HyBrid Architecture & Assembly, whose company has incorporated the spaces into homes throughout the city. Those in the market for a new or remodeled home are increasingly asking for rooftop open space, says Humble. In neighborhoods such as Capitol Hill and Ballard, where space is tight, rooftop decks are particularly sensible. While a tiny front yard might be enough for a folding lawn chair, a rooftop deck provides plenty of space for entertaining. But be aware that your expansive party palace comes at a cost. Humble has a rooftop deck atop his modern-style Central District home, but admits that it took a few years and a significant amount of money to transform it into the entertainment space it is today. To turn a barren rooftop deck into a livable space means adding a number of elements including tables, chairs and comfy couches, as well as planters and plants. Infrastructure is also important. Gas lines, water lines and electricity allow you to add a gas fire pit, running water or a small kitchen. Without these amenities, homeowners can find themselves shuttling food and drinks up to the roof from a kitchen. Gas fire pits can provide warmth when the sun goes down and are handy for toasting marshmallows. As for furnishings, many retailers offer modular seating systems made with materials designed to weather the elements. Humble says large tropical plants in equally large pots are also surprisingly amenable to rooftop living, thriving in direct sun and faring well despite winds.